The problem with modern society is that it is centered on a system based upon selfishness. Capitalism was established by thieves and slave owners, and serves only to maintain power for those who stole everything from everyone. Private ownership of the means of production allows individuals to dictate production and distribution of necessary resources. Such fouled ideology is backed by millions of oblivious individuals who believe in a dream that was concocted to throw all into submission. 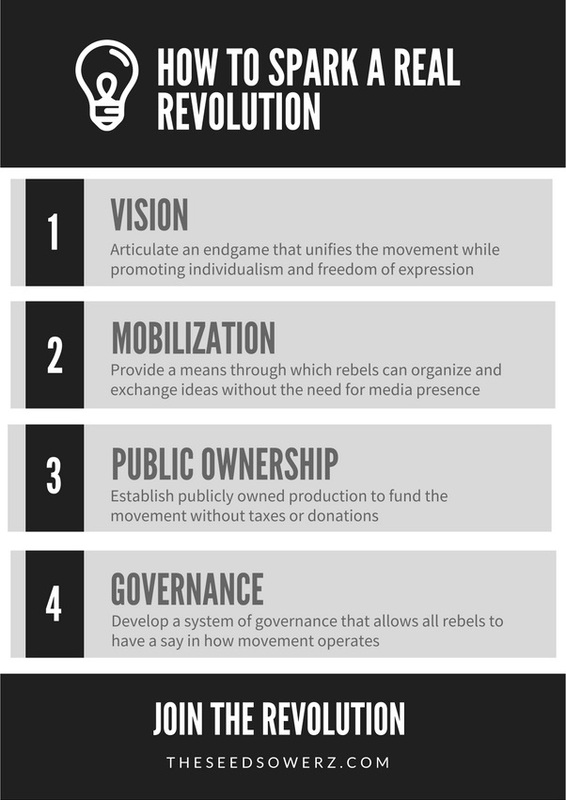 Our main priority for this revolution is to demonstrate how community ownership provides greater prosperity than capitalism ever will. The owners of this corrupt system have gone through great lengths to prevent The People from learning the truth about community ownership. Hordes of capitalist drones troll through every social network spitting out brainwashed one-liners at anyone who mentions anything resembling communist thought. We are taught such lies on the news, at school, and in every institutionalized entity that comprises the capitalist system. All who comprehend that this system is owned by tyrants must at some point question why the owners hate communism so much. The key to understanding the communist feud starts with basic economics. Economics is the science of production and distribution of goods and services. Whoever owns the means of production dictates distribution and essentially owns the entire economic system. The means of production can either be owned by an individual (capitalism), a government (socialism), or a community (communism). Socialism is the basis for every centralized government on earth. Any nation that taxes its people is a socialist nation. Republicans who preach against socialism while defending the concept of taxes are ignorant hypocrites. Karl Marx theorized that socialism would lead to communism because communities cannot own production in an industrialized nation without a stable government. Lenin and Stalin developed their own brainiac versions of socialism to rapidly industrialize Russia so they could prevent European invasion. The philosophies of the USSR, Cuba, China and other alleged communist nations are in fact socialist ideologies. The communist debate arose amid a turbulent era. Capitalists were funding both sides of every conflict during a time when there was limited technology, rampant illiteracy, famine, plague and an unstable political system. Millions of people were yearning to break free from their capitalist oppressors and create greater prosperity for workers. The obvious solution was to create a government consisting of the oppressed workers and establish a means of production to fund their existence. The communist debate spread through the masses like an epic game of telephone. When capitalists caught wind of what was being proposed they used every resource they could muster in order to squash the rebellion. Decades later Lenin and Stalin dominated a nation of illiterate peasants with their own deplorable philosophies and called it communism. Modern perception of communism is thus contributed to Leninism and Stalinism, and bears no resemblence to communist thought. Community ownership suggests that the community decides how the production operates. If community members have no say in how the production operates then it is not communism. Community ownership can be structured in many different ways. The community can consist of workers whereupon the workers decide how the production operates and how wages are distributed. The community can consist of activists working for a cause and all profits from production are used for that cause. A city or town can own production and use the profits for community improvements. A community can start a retail or grocery store and offer shares to community members. This model is prevelant in many small towns throughout the US consisting of retail and grocery stores. A community can own utilities that operate with no profits so community members have lower bills. Several communities own sports teams, however these are non-profits. In the wake of global oppression, we conclude that the most logical way to dissolve the powers that be is to compete against elitist production. The best way to compete against elitist production is through community owned production. The elite are successful because they have a large consumer base and produce good and services that individuals can’t compete against. Community owned production has a built in consumer base. All profits from community owned production get pumped back into the community. If communities were to establish production to compete against elitist production, communities would put the elite out of business. Community ownership could also help to reduce prices. Since community ownership is not tied to investors, jobs take precedence over profits. As long as the production can sustain itself, it doesn’t matter whether profits are made. Breaking even still provides jobs.